Who’s Arming Radical Militants in Syria and Iraq? The Western coalition’s struggle against the notorious Islamic State terrorist organization stands at the edge of one thousand days of military operations against. A thousand days ago, American warplanes opened a new chapter in its Middle Eastern military campaigns, by launching an attack against terrorist positions in Iraq, and then in Syria. A thousand days and and a thousand nights – is an immense amount of time in terms of modern warfare, when the geopolitical situation dictates a rapid course of action. This is especially true in the Middle East, where in the past three years there have been unprecedented changes in the alignment of forces and interests. Despite certain successes in this struggle, achieved by both the American and Russian coalitions, unfortunately, one must note that the fight against international terrorism has been unjustifiably dragged down. The main reason for the fight taking so long is not the alleged amount of support that the idea of a “world caliphate” has received in the region, but rather Washington’s interest in maintaining tensions across the Middle East. Thus, it’s been using ISIS as it used to take advantage of Al-Qaeda’s existence. Unfortunately, it is also necessary to recognize that the interests of US military contractors in the eyes of Western politicians overshadows any other public concern, leaving the arms market at the mercy of gun traffickers. And why should we even be surprised by the fact that the alleged “fight against international terrorism” is taking so long, when what was supposed to be a humanitarian operation carried out by the international community has been transformed into an arms dealer’s paradise? 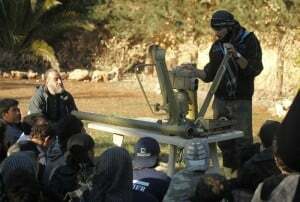 Small arms shipments to militants don’t surprise anybody, as terrorists began receiving artillery systems, anti-aircraft guns and even tanks, which not only exacerbates the level of violence in the Middle East, but also makes ISIS opposition that much stronger. Thus, it has recently become known that the so-called Free Syrian Army, which received a extensive amount of support from Western states and Turkey, has begun selling its tanks to the Islamic State, as it’s been reported by Turkish media source BirGun. As it’s been noted by the publication, Turkish armored vehicles participating in Operation Euphrates’ Shield in northern Syria somehow fell into the hands of FSA units that decided to then sell them to ISIS. Over the past five years numerous media sources have repeatedly stressed the existence of illegal arms trafficking channels stretching from the EU, primarily from the Balkan and Eastern European states, to terrorists in Syria and Iraq. However, any hope that this information could be of interest to law enforcement agencies charged with putting an end to these illegal activities or the governments that claim they are engaged in combating international terrorism activities, has fallen flat. Both the Balkan Investigative Reporting Network (BIRN) and the Organized Crime and Corruption Reporting Project (OCCRP) have repeatedly exposed the participation of a number of European countries and Persian Gulf monarchies in the ongoing sale of weapons to extremists, which initially started back in 2012. The total worth of arms sold has surpassed 1.2 billion euros, effectively transforming the so-called “Arab Spring” protest movements into a source of perpetual armed conflict. Since then, thousands of weapons and munitions have been smuggled from the Balkan countries to the Persian Gulf states and those countries that share a common border with Syria. It is not difficult to confirm that this grenade was produced at the Vazovski Mashinostroitelni Zavodi (VMZ) in Bulgaria, if one is to compare it with the one featured at the official site of VMZ in the list of products. Both the markings and the appearance of the munitions are identical. A video of the Bulgarian weapons is fresh, dated April, and anti-tank grenade launchers are used by extremists against Iraqi forces, who are now trying to recapture the so-called ISIS capital in Iraq – the city of Mosul. The absurdity of the situation is that these terrorists are shooting Bulgarian weapons bought with money provided by American taxpayers, trying to kill, among other targets, American servicemen. The head of Conflict Armament Research, James Bevan, has clearly stated last year that anyone who arms the so-called Syrian opposition has no control whatsoever over where the weapons are going to be used. Pretty much the same scenario occurred in Afghanistan back in the 80s, when the United States, Saudi Arabia and their allies supplied weapons to Pakistani intelligence. The fact that the United States carries on large-scale shipments of Bulgarian weapons to the “moderate” opposition in Syria has recently been uncovered by the Bulgarian newspaper Trud. According to the media source, last March alone, Danish vessel Marianne Danika made 2 trips from the Bulgarian Burgas to the Saudi city of Jeddah, carrying tons of weapons that are now delivered to Syria via Turkey or Jordan. The newspaper is convinced that there is a network for the delivery of weapons to all sorts of terrorist groups under the guise of arming the “Free Syrian Army”. In addition, Western intelligence agencies are financing terrorist groups directly, thus enabling the latter to buy weapons on the black market. Due to the fact that a handful of reports published by various media sources on ongoing illegal arms deliveries to terrorists continues to go unnoticed by both the UN and the leading Western politicians, the question arises: why has there been no credible investigation launched into these allegations? Or maybe there are structures and politicians who, while being tasked with fighting terrorism, are in fact encouraging it, making millions of dollars from such arms sales?